Phoenix, Ariz., Aug 7, 2009 / 04:10 pm (CNA).- Researcher and physicist Dr. Aldofo Orozco told participants at the International Marian Congress on Our Lady of Guadalupe that there is no scientific explanation for the 478 years of high quality-preservation of the Tilma or for the miracles that have occurred to ensure its preservation. What is the position of the Orthodox Church on the veneration of this image? Is the Guadalupe image venerated as an Icon by Orthodox believers in Mexico? Although it is depicted in the Antiochian monastery of St. Anthony the Great in Mexico, I'm not sure that it is actually venerated as an icon by the Orthodox there. Here are some pictures from his visit in the Cathedral of Our Lady of Guadalupe. Some believe that Juan Diego never existed and therefore the picture is not of a supernatural character. This is one of those things where the church claims infallibility but this is a pill I've never chosen to swallow. Do Orthodox venerate St. Philemona? This is a very early saint (venerated by the Cure d'Ars, John Vianney) for which there is a body of work challenging its historicity. Interesting manner in which to "venerate" the image. I somehow do not equate grasping a framed image with both hands and holding the image up to examine as "veneration". .....EP even offered candle to the heretic phantasma of Lourdes, I do not know if he really believe that this phantasma is"immaculada concepciou",and Theotokos. Anyway,this is not the worst thing he ever did,we are so sinful,not worthy to have a better EP.If o Theos sent us an angel-like、saintly、orthodox EP,maybe we would murder him——like the unworthy monks did to St.Benedictus. By saying that She is "immaculada concepciou", this phantasma, as you call Her, didn't mean Her conception but Christ's. The date of the apparition proves that. Indeed, the devil always loves to foment fervent devotion to Christ and Our Lady. Exactly,like "Sacra Cor"and many other horrible and bloody cults——the diabolus is not a good aesthete. 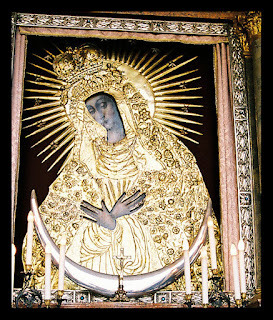 The image of Our Lady of Guadelupe is not part of Orthodox tradition, there is no feast-day appointed in any Orthodox calendar or menaion for this image's liturgical veneration, and there are no liturgical texts (not even a troparion or kontakion) associated with it. In short, the Guadelupe image cannot be venerated as an icon by Orthodox believers. But do you really think that the Orthodox monastery in Mexico is in the wrong by depicting the image among its frescoes? I can understand why the Christians of Mexico would not want to abandon this image of the Theotokos, as it is a large part of their history and national identity. It is a bit of a conundrum and presents several dilemmas, but I am not wholly convinced that the image should be abandoned entirely. Perhaps it could be modified to meet Orthodox iconographic standards, but still retain enough of a likeness to be identified by the Christians of Mexico. In short, the Guadelupe image cannot be venerated as an icon by Orthodox believers. I believe it can - in a form of a private devotion. No. What feast is there on March 25? Well, what is actually far more likely is that His All-Holiness was presented with a copy of the image as a gift and is holding it up for the cameras. Judging from the way it is being held by the Latin Bishop on the floor in the first photograph, the image is not actually being venerated. His All-Holiness received the gift and then held it up to be photographed. Pictures only speak the thousand words we wish to make them say. They say nothing on their own. Thankful for a well intentioned gift? Imagine that. Forgive me,I cannot follow your logic.All papists beleive that when the phantasma of Lourdes told Bernadette Soubirous "que soy era immaculada concepciou",she actually proved the latin doctrine of Immaculate Conception. Now you say all papist misunderstood the message,in fact the phantasma talked about the conception of Christ and the Mysterium of Euangelismos......if so,why she said"que soy era"? Do you think that phantasma try to say she/he/it is Christ himself? Heaven forbid a logical and most likely correct answer is posted...it's spoils all the EP bashers' fun. Do you, then, consider the Antiochian monastery of St. Anthony the Great in Mexico not being a part of the Church? Forgive me,I cannot follow your logic.All papists beleive that when the phantasma of Lourdes told Bernadette Soubirous "que soy era immaculada concepciou",she actually proved the latin doctrine of Immaculate Conception. Now you say all papist misunderstood the message,in fact the phantasma talked about the conception of Christ and the Mysterium of Euangelismos......if so,why she said"que soy era"? "Que soy era immaculada concepciou" doesn't mean "I am the one whose conception was was immaculate". It means "I am the immaculate conception". "Conception" means "formation of sb/sth", "making of sb/sth", or "begining of sb/sth". So the sentence can be changed into: "I am the immaculate begining". Beginning of who? Of Herself? No, of Christ-in-Flesh. A monastery can be a part of the Church but never "the Church"itsself. One abbot or his whole synodia can be wrong,but never"the Church". Such definition of "Immaculate conception"is yours,not of papists'.You can give whatever interpretation on the latin doctrine"Immaculate conception"as you want,but don't tell us you know better than all papists and the whole world what papists do believe. I would assume that the Church did not authorize said painting. Many churches are built, painted and decorated by local parishioners...and while they may be well meaning, they are not always canonically correct in their efforts. Such definition of "Immaculate conception"is yours,not of papists'. I have never said it's of papists. You can give whatever interpretation on the latin doctrine"Immaculate conception"as you want. . . I was not inerpreting the latin doctrine of the "Immaculate conception". I was interpreting the Lourdes apparition. . . .but don't tell us you know better than all papists and the whole world what papists do believe. Please, show me a single word I said about papists' belives. The painting of the Theotokos of Guadalupe in the Antiochian monastery of St. Anthony in Mexico may be considered canonical or non-canonical. But it proves one thing - that the Guadalupe image is venerated in the Church. Not on a large scale, maybe only in that monastery, but it is. I'm sorry....you did not say that you know better than all papists about the "immaculate conception"doctrine;you actually say that you know better than all papists about the Lourdes apparition——all papists misunderstood the message of the "Lady",but you got the ture meaning of it. But it proves one thing - that the Guadalupe image is venerated in the Church. Not on a large scale, maybe only in that monastery, but it is. What it means is that the image is venerated in a church (lower c), not in the Church. And maybe you should choose another place to spread irony and contempt. A church of the Chruch. It seems to me that the iconographer simply "got it wrong". The image of Our Lady of Guadalupe is certainly not an Orthodox icon nor should it be venerated as such. What "should" happen is that it be removed and an Orthodox icon of the Theotokos take its place. This does not translate into the monastery not being a part of the Church anymore than one of us erring in our daily lives suddenly ceases to be Orthodox. The image of Our Lady of Guadalupe is certainly not an Orthodox icon nor should it be venerated as such. What makes this image un-Orthodox apart from the fact that it wasn't painted by Orthodox? 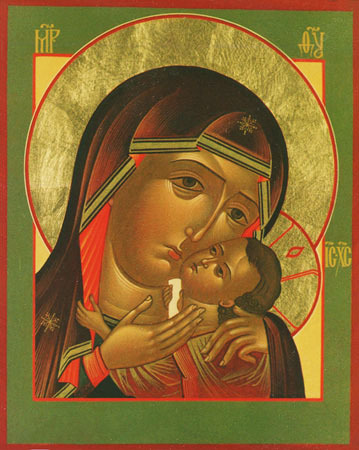 As far as the visual part of it is concerned, there is quite a similar Orthodox icon, Our Lady of the Gate of Dawn (http://tiny.cc/02LW1), venerated by the Polish Orthodox Church on December 26/January 8. What "should" happen is that it be removed and an Orthodox icon of the Theotokos take its place. Orthodox churches around the world have a lot of stuff to be removed - all these Da Vinci's Last Suppers, van Balen's Holy Trinities, Rubens' Virgin Marys, etc, etc. But we should remeber what was taught by St Seraphim of Sarov (if I remeber correctly) - that even poor iconography or not iconography at all shouldn't be ridiculled or treated with lack of repect, because a prayer said in front of a 19th century painting, but with a true faith, humility and love, is far more pleasing to God than an insincere prayer said in front of a perfectly canonical icon. And moreover, God does work mirracles through images which canonicity is questionable, vide: the myrh-streaming icon (painting?) of St George in Ramla, Israel (http://tiny.cc/5rDkA ). Let's agree to disagree then. I don't wish to argue the point. Our Antiochian parish here in Austin, Texas has an icon of Our Lady of Guadalupe (it's called something else on the icon though). It is however not visible. It's behind the iconostasis next to the table of preparation. Our parish was founded by Lebanese immigrants, btw. But we should remeber what was taught by St Seraphim of Sarov (if I remeber correctly) - that even poor iconography or not iconography at all shouldn't be ridiculled or treated with lack of repect, because a prayer said in front of a 19th century painting, but with a true faith, humility and love, is far more pleasing to God than an insincere prayer said in front of a perfectly canonical icon. And moreover, God does work mirracles through images which canonicity is questionable, vide: the myrh-streaming icon (painting?) of St George in Ramla, Israel (http://tiny.cc/5rDkA ). If you read the link I posted earlier, the stories on the supernatural origins of the painting appeared many years after the introduction of the image. Looked at it from that point of view, it's a pious image that took on an "apparitional" meaning after the fact. The same can be said for the origins of the Dominican rosary. A pious custom that became blessed, I think decades, after the fact, with a story ascribed to St. Dominic. The online 1913 Catholic encyclopedia actually has very good (non-supernatural) descriptions of a great many Catholic customs, largely from Jesuit Herbert Thurston. Much of this phenomenon is an expression of "popular catholicism" that later (theologically modified) was made acceptable practice for believers. The brown scapular is another pious devotion - the church had to invent an entire theology that said it was not, in fact, a "ticket to heaven" notwithstanding the legendary promise associated with it. The St. Benedict is another popular sacramental with legendary promises associated with it. Having an Italian on the seat of Peter helped give an official imprimatur to a lot of Marian devotions which were popular in places like Italy, Spain or Poland. Anyway, to get back to the main topic, I personally do not believe there is anything supernatural in character to the Guadalupe image. There's nothing wrong with it, but I don't believe there's a Juan Diego, any more than I subscribe to the legends associated with the origins of the rosary. The problem is that if you have sympathetic people in the higher ups of the church, it tends to push the skeptics to the side, which is why (for me) Juan Diego's canonization is problematic, because it canonizes the entire legend associated with the image. This icon is beautiful! Is it truly Orthodox, or is it Catholic in origin? This image, known as Ostrobramskaya, arose from Polish Roman Catholic tradition. Actually, it was Orthodox first and known as Khersonskaya. It had "More honorable than the Cherubim, and more glorious beyond compare than the Seraphim" inscription. It went to the hands of Catholics (first Byzantine, then Roman) at the time of the schism of Brest. In 1829, the icon was renovated and some Western features were added to it. There is no resemblance at all in iconographic type or composition between Ostrobramskaya and Korsunskaya. The previous name of the Ostrobramskaya indicates where the icon was brought from, nothing more.